One of the major items in a distributors bag to get information out about a film is the trailer. They originally ran after the film. That’s why they are, still, called trailers. They “trailed” the film. Nowadays they are ran in a better position. Before the film starts. A place where people can see them as what used to happen is people left the auditorium at the end of the main feature and missed the adverts for upcoming films! Why they thought playing this after the film still confuses me. Trailers do have a language of their own. They have to catch your eye in around 2 to 3 minutes. Not try and give away the plot. Sometimes they do include scenes either specifically shot for this purpose or, occasionally, have scenes that finally hit the cutting room floor in editing. Most of the time they are quite successful in making you go out and watch the film. Sometimes they manage to give away major plot elements. The main culprit for this is The Sixth Sense. That trailer gives away the “twist at the end”. Something that has been slowly been removed over the years is “voiceover man”. A gruff voice that helps to explain what you can see, where you can see it or when the film opens. A great one for that has to be “The Mother Of All Trailers”. A wonderful cliché ridden, parody of a, trailer that shows this to the humorous extent that it has become. An overused cliché of a bygone era. All genres have their own language for the trailer. Horror ones have to make you jump at some point. Acton films have to show something blowing up. Sci-fi ones have to show a shot of space. The glorious way that humanity has gone, or not in some cases. Comedy ones have to make you laugh throughout. The list goes on and on but you know what sort of film it will be from the first couple of seconds of the trailer. With all that out of the way, I do have to say that I love these small masterpieces. No mater how bad the film actually turns out the trailer is always a good snapshot of the film. As I have mentioned before, the old “Voice over” can be used to change the feel of a film. There are some great ones out there. For me the best one is the “The Shining as a comedy” trailer. All they have done is change / add a voiceover. It works wonderfully in changing your outlook of that classic film. Before I go, I should leave you with a trailer. This is a new one. It is one of the best starts of a trailer I have seen in many years. I must have seen thousands of trailers over the years, ranging from very dubious “Art-house film” ones all the way to the “Next blockbuster”. This one has just made me go “wow”. It just grabbed me straight from the start. I do feel it went downhill when a certain actor in the film starts talking. It maybe just because I associate that character with Marlon Brando. Just to finish off. 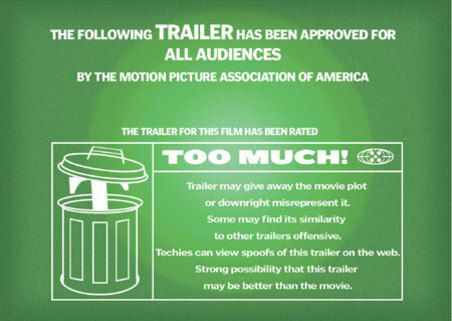 Sometimes you see this on trailers. “The Best X of the year”. This is mainly used very early on in January to describe some of the worst films to be released that year. Yes, this is mostly used on the poster but they do sometimes creep into the trailer. Just don’t ask me to come up with any to illustrate the point but trust me they are out there somewhere. Just hunt around youtube and I’m sure you can find an example of two. If you do then please put them in the comments below.